The University of Illinois Springfield Mock Trial Club recently finished in fifth place out of 28 teams during the 2018 Jayhawk Invitational hosted by the University of Kansas in Lawrence, Kansas on January 27-28, 2018. The group of seven UIS students defeated four nationally-ranked teams to win the fifth-place title. A total of 19 nationally-ranked teams took part in the invitational. The UIS Mock Trial Club went 5.5-2 with a combined strength (CS) score of 21.5. CS scores are an indicator of the strength of a team's competition and serve to break ties. UIS had the highest CS score out of any ranked team in the tournament, which means UIS faced some of the toughest competition in the tournament. UIS students who took part in the competition include Chance Austin, Andrew Jarmer, Courtney Johnson, Christopher Marbaniang, Joseph Partain, Mario Saucedo and Jayde Schlesinger. The team is coached by UIS alumnus Nathan Hoffman and attorney-coach Rex Gradeless, a UIS adjunct assistant professor. 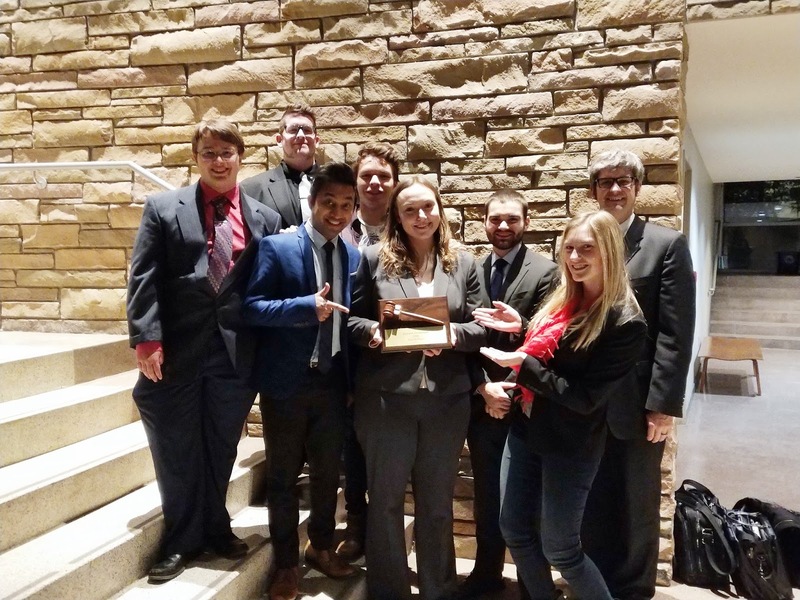 One week earlier, the UIS Mock Trial Club participated in the Dr. Donald P. Racheter Invitational hosted at Central College in Pella, Iowa on January 20-21, 2018. At that tournament, with an overall 4-4 record and a CS score of 16, the Mock Trial Club set a new the school record for ballots won at an invitational (4), tied the school record for most overall number of ballots won (4), and received the second-highest score in team history. Additionally, freshman Joseph Partain received an individual Best Attorney award. All these records, however, were broken at the Jawhawk Invitational and the Mock Trial Club surpassed the highest score in the team’s history. The Mock Trial Club at UIS is part of the American Mock Trial Association (AMTA). AMTA serves as the governing body for intercollegiate mock trial competition. Through engaging in trial simulations in competition with teams from other institutions, students develop critical thinking and public speaking skills, as well as a knowledge of legal practices and procedures.